Another recent acquisition. This guy is just as impressive as the rest of this little herd we brought to our farm early last spring. 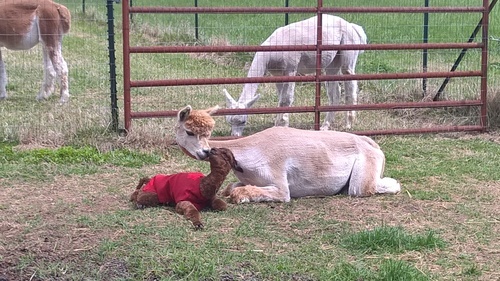 Chief is a handsome fella, he is a proven breeder and has produced four spring 2018 cria. 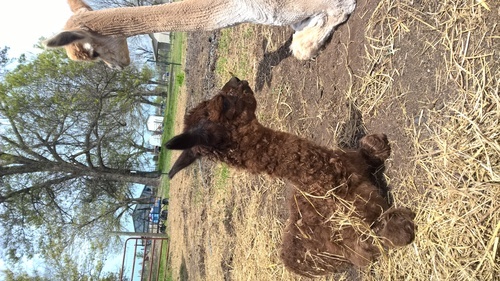 We are excited to get such fine quality cria. Chief has been bred to some of our finest females for 2019 spring delivery. Bethany is the first newborn on our farm. She is just an amazingly high quality animal. She has a sweet and friendly disposition. Bethany will be ready for her first breeding Spring 2017. Bethany was bred to our TCAF Chief. This is Titus, he is the product of our TCAF Chief and SMAR Bethany. His dam Bethany was the first to be born on the farm from Bo Peep, so he represents a third generation here at Shady Meadows. He is very friendly and eats out of hand frequently (I don't allow him to very much). 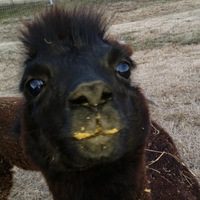 He has a gorgeous reddish brown fleece and he's just a puff ball of good fun. His cria coat will fetch a handsome price come shearing in the spring. I am short on space for males come springtime so here's an opportunity to pickup a great future herdsire. His bloodlines are solid and his qualities are prime.